Removes calcium deposits and lime build-up from pots, pans, coffee makers, tea kettles, steam irons, humidifiers, and even dishwashers. Cleans and shines metals, including copper dishware and stainless steel sinks as well as chrome and brass. Contains extra grease cutters for effective use on kitchen surfaces. Green Cross Certified. Available in 22 ounce bottles. Click here for more information. Gently dissolves the toughest hard water deposits, soap scum, and oily films from tubs, glazed tiles, showers, shower doors, and metal fixtures, leaving them shiny clean. Use Descale-It Bathroom Cleaner on chrome,stainless steel, tile, Formica and enameled woodwork for easy, non-abrasive bathroom cleaning. Green Cross Certified. Available in 22 ounce bottles. Click here for more information. A thick liquid bowl cleaner that clings to porcelain while its active ingredients penetrate and remove the toughest rings and rust stains. Will not harm septic systems. 100% Biodegradable. Available in 16 ounce bottles. Click here for more information. Removes sun-baked waterline deposits and water spots common to swimming pools and spas. Designed to emulsify and remove scale rings, crust and film from glazed tiles, metal, acrylic and fiberglass surfaces. Will not affect the pH balance of when used as directed. It also cleans pumps and louvers, extending their normal useful life. 100% Biodegradable. Available in 32 ounce bottle in Variety Pack. Click here for more information. Extra-strength formula designed to keep the cool breezes flowing through your cooler by removing hard water deposits from cooler louvers, pads, fittings and reservoirs. It transforms hard, crusty scale into a puffy white paste that rinses away. Descale-It® Cooler Treatment is safe on all cooler surfaces, emits no fumes, and cleans CELdek®. 100% Biodegradable. Available in 32 ounce bottle in Variety Pack. Click here for more information. Removes water spots from fiberglass, acrylic and other plastic surfaces without scratching, clouding or scrubbing. Cleans and shines stainless steel, anodized aluminum or chrome. Works with fresh water or salt water. Improves the appearance of boats, jet skis, outboards and other water sport equipment. Effective on fiberglass, plastics, aluminum, chrome and stainless steel. 100% Biodegradable. Available in 32 ounce bottle in Variety Pack. Click here for more information. A unique composition which easily and effectively removes hard water scale, lime deposits, iron scale and rust from metals, glass, ceramics, fiberglass, rubber and plastics without marring or discoloring surfaces. Effective on evaporative coolers, cooling towers, air washers, water distillation units, heat exchangers, boiler/steam generating equipment, coils, pipes, fittings, and water fountains. Not recommended for use on colored grout or natural stones, unless properly sealed. Available in 1 gallon (4 in a case), 5-gallon pail or 55-gallon drum. Click here for more information. Formulated especially for the animal population--this 100% biodegradable cleaner removes calcium deposits, cleans glass, plastic, copper, porcelain, stainless steel, fiberglass, cultured marble and more non-porous surfaces without pitting or scratching. Cleans aquariums, cages, dishes, litter boxes, water troughs, and more. 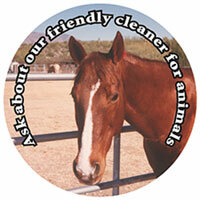 Your pets and livestock will love you for their clean home! Available in 16-ounce bottles. Click here for more information. 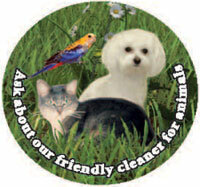 Ask about our earth friendly cleaner for animals.